Around 1:00 AM Sunday morning I was awakened by a car alarm and laughter. It went on long enough to get me out of bed and to the window, but was just noisy party-goers leaving a neighbors house and accidentally setting off their car alarm. I crawled back to bed, but couldn't drop back into my dreams. What kept me awake was that I had been looking at my financial statements just before heading to bed. There was an apparent problem, a $5,000 discrepancy that I felt should have been in my bank account but was not. I had decided to look at that in the morning, but now I squirmed around and pummeled my pillow as the figures darted around my mind. Something was wrong and I wouldn't get any more sleep until I found out what. There was a time when I wouldn't lose any sleep over something like that. I don't mean that it wouldn't have concerned me; just that I would have been able to get back to dreamland easily. In the current economy, the apparent problem nagged at me more insistently. I don't have the cushion I used to have and the prospect of new business is far less certain than it was in the past. This missing $5,000 was worrisome. So I fumbled for my glasses and then rolled out of bed. Tiptoeing out of the bedroom and slowly closing the door behind me, I walked toward my patiently waiting computer and woke it from its sleep. Let's get to the bottom of this mess, shall we? It turned out to be nothing - just a case of me not paying close attention. I knew there was a $5,000 invoice coming due this week, but when I had looked at the bank account balance, it seemed that paying that would leave me without enough cash to pay other bills. What I forgot was that I had already cut the check - the bank balance reflected that money already paid and gone. There was no problem. That's unusual for me, Usually I have a very good mental picture of where I am financially - what's in the bank, what should be coming in soon, what needs to be paid out. Financial figures are a backup, a check on my internal accounting that seldom causes any surprise. That's as it should be - most business financial problems don't jump out of the bushes. If you have a good idea of your overall position, you should be able to see problems coming well in advance. Who cares about Profit and Loss? I use Intuit Quickbooks for my accounting. That program offers a number of financial reports. If you are new to running a business, you might think that the most important report is "Profit and Loss" (sometimes called an "Income Statement"). 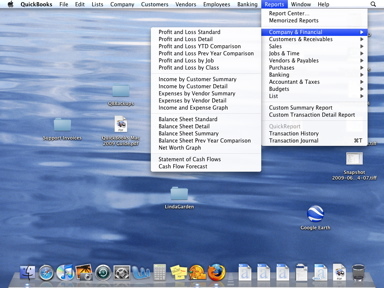 Indeed, the Quickbooks report menu offers that as your first choice - it must be the most important report, right? No, in fact I hardly ever look at the P&L at all. The primary report hat keeps me aware of where I am is the Balance Sheet. That's the meat of your business, what tells you at a glance where you stand, what's happened in the past and what the future holds. If you could only look at one financial report, this is the one you'd want. There are just four things you need to look at. Everything else is just detail that you may want to see out of curiosity, but these four things are what really matters. The first is your checking account balance. That's how much money you have in the bank right now - that's obviously important. Available cash is like oxygen to your business - if you don't have enough, you die. How much do you need? . After more than a quarter century of looking at my own reports, I have a very good feel for what I want to see there, but if your business is new, you may not know. We'll dig deeper to try to help you figure that out. The next number you want to see is Accounts Receivable. That's money people owe you. Presumably over the next few weeks that money will move from A/R into your checking account as customer checks come in. If you are tight on cash, you may be concerned about WHEN that money is coming, but for now we'll just assume that it's a steady and reliable flow of cash. Indeed, my A/R stays very constant - it increases as I bill more work and decreases as checks arrive, but it remains at a fairly steady figure. Significant changes there could be cause for concern: if it is less than usual, I may not be billing enough. If it's more, people may be paying me more slowly. That's why I'm constantly aware of that figure and the details that support it. Next comes liabilities. That's money you are going to have to pay out. Again, that's a fairly constant figure. If it goes up, my costs are increasing - I must be paying more for the things I'm selling. The relationship of cash, A/R and Liabilities is important. Normally you should have a good balance there: if you are buying things that you resell to customers, you would hope that your customers pay you before you have to pay your suppliers. If that's not the case, obviously you need to keep more cash on hand. Finally comes equity. I'm not interested in earnings (reported at the top of the Equity section of the report). I want the final figure - Total Equity, For a sole proprietor, that's the money available to pay yourself , spend on new advertising, buy new equipment and so on. It's your profit, effectively. Again, that is a figure whose range I am very aware of. If it drops too low, that's because I have problems higher up on the Balance Sheet - too many liabilities, not enough assets. If it's higher than normal, I'm flush - time to take some extra money or invest it in equipment, advertising or whatever. These four numbers should be in your head always. Cash on hand, A/R, Liabilities and Total Equity. With those, you know exactly where you are. The details may be important if you aren't where you should be, but if your business is just clicking along healthily, these are what will tell you that. If you are heading for trouble, those numbers tell you that also. Everything else is just details. Possibly important, especially when the overall numbers aren't making sense, but just details. If you know the Balance Sheet totals, you know your business. Well, unless you forget that you've already paid a big bill and get woken up in the middle of the night. If you pay closer attention, you won't lose any sleep over things like that.